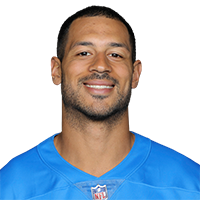 Analysis: Thomas comes back to the Lions after spending two years with the Bills, who signed the former Virginia Tech quarterback off Detroit's practice squad in November 2016. He presumably will spend this offseason trying to push Michael Roberts for the No. 2 job at tight end behind Jesse James, though it's possible the Lions could add more competition via the upcoming draft that has a strong class at the position. 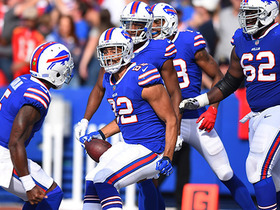 The Bills declined to tender Thomas a contract for 2019, making him an unrestricted free agent, Mike Rodak of ESPN.com reports. Analysis: Thomas split time between special teams and offense last season, notching 12 receptions for 77 yards without a touchdown across 12 games. He did most of his damage during a Week 9 loss to the Bears, posting seven catches for 40 yards in that contest. Now free to go wherever he pleases, Thomas will look to secure a depth role at tight end in advance of OTAs. Thomas finished the 2018 season with 12 catches on 17 targets for 77 yards and no touchdowns across 12 games. Thomas was unable to haul in his lone target during Sunday's 24-12 loss to New England. Analysis: Thomas has caught just one of four targets since rookie Josh Allen returned to the starting job. The Virginia Tech product has been held to one or no catches in every game this season with the exception of Week 9's seven-catch explosion against Chicago in a game in which Nathan Peterman was under center. Though the season ends with a matchup against a bottom-10 Miami pass defense, odds are that there won't be enough opportunities for Thomas for him to make a difference. Thomas (hamstring) was a full participant in Thursday's practice session. Analysis: Thomas has some recent action due to his hamstring injury, but it appears he may have turned a corner after his full practice Thursday. He'll look to resume his role as a backup tight end for the Bills against the Patriots in Week 16. Thomas (hamstring) was a limited participant in Wednesday's practice. Analysis: Thomas has missed two of the Bills' last three games due to a lingering hamstring injury, leaving his status for Sunday's divisional tilt against the Patriots uncertain. If the depth tight end is unable to suit up Week 16, more snaps would be available for backup tight end Jason Croom behind starter Charles Clay. Thomas (hamstring) is listed as inactive Sunday against Detroit. Analysis: A late addition to the injury report, Thomas will miss his second contest in just a three-week span. Charles Clay should once again draw the start, with Jason Croom on hand in a reserve capacity to help out primarily as a blocker. Thomas (hamstring) is listed as questionable for Sunday's matchup with the Lions. Analysis: Thomas was a late addition to the injury report, registering a full practice Thursday. The Virginia Tech product was able to practice Friday as well, but in a limited capacity. Thomas is listed last on the tight end depth chart and only has three targets in his last two games, so the team likely wouldn't be impacted much if he misses the game Sunday. 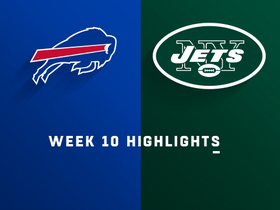 Thomas caught one of two targets for five yards Sunday in the Bills' 27-23 loss to the Jets. Analysis: Thomas played nearly as many offensive snaps (36) as starter Charles Clay (42), but neither tight end saw much involvement in the passing game. Opportunities could be more difficult to come by for Thomas in Week 15 against the Lions if fellow reserve Jason Croom (groin) is able to avoid a second consecutive absence. Thomas was a healthy inactive for Sunday's game in Miami. Analysis: It's unclear whether Thomas wasn't in ideal game shape due to the birth of his child this week (he missed practice Thursday) or if he's simply been bypassed by Jason Croom on the depth chart, but with Charles Clay back in the mix, Thomas would only see a handful of plays even if he did suit up. No matter: Clay and Croom combined for one catch for nine yards in Sunday's loss, so it's not like Thomas was missing out on a fantasy bonanza. Thomas (personal) doesn't appear on the Bills' final injury report ahead of Sunday's game against the Dolphins. Analysis: After he was away from the team Thursday to witness the birth of his child, Thomas returned to work a day later and should be ready to play Sunday. Thomas' fantasy value is pretty non-existent, especially with starting tight end Charles Clay (hamstring) having a decent shot to play this weekend. Thomas missed practice Thursday due to personal reasons, Joe Buscaglia of WKBW.com reports. Analysis: The coaching staff hasn't said yet if Thomas will be back for Friday's practice, though with starting tight end Charles Clay (hamstring) looking to return soon, Thomas' time on offense is about to become even more sporadic. Thomas' teammate Charles Clay (hamstring) is listed as doubtful for Sunday's game against Jacksonville. Analysis: That means Thomas will likely share starter's time with Jason Croom, though like his teammate Thomas didn't do much with the extra playing time when Clay missed the last game, catching his only target for one yard. Thomas did post a 7-40-0 line the game before that, but with zero or one catches in every other game this season, you can find better tight-end options instead of trying to play the injury angle here. 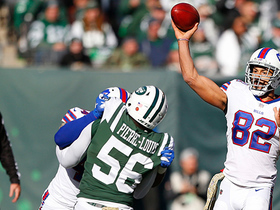 Thomas caught his only target for one yard during Sunday's 41-10 win over the Jets while seeing action on 41 percent of the Bills' offensive snaps. 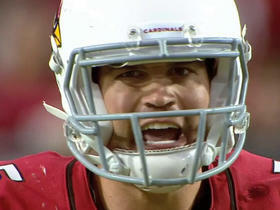 He also completed a 15-yard pass on a fake punt. Thomas and Jason Croom will share tight end duties Sunday versus the Jets with Charles Clay (hamstring) out of the lineup, Chris Brown of the Bills' official site reports. Thomas caught seven of eight targets for 40 yards in Sunday's 41-9 loss to the Bears. Analysis: Thomas' extended usage came as a result of Charles Clay exiting early with a hamstring injury. Mistake-prone quarterback Nathan Peterman checked down to the tight end often, but none of Thomas' catches went for double-digit yards. Even if Clay misses the upcoming Week 10 clash against the Jets, it will be tough to rely on Thomas with Buffalo's offense in shambles. Thomas (coach's decision) is inactive for Sunday's game against the Vikings, Sal Maiorana of the Rochester Democrat Chronicle reports. Analysis: Thomas has two receptions for 31 yards over the first two games, but a majority of his usage was still on special teams. Khari Lee may see a slight uptick in opportunities in Thomas' absence. Thomas caught one of two targets for 24 yards in Sunday's game against the Ravens, the team's longest pass play in a forgettable 47-3 loss. Analysis: Thomas appears to be sharing No. 2 tight end duties with Jason Croom behind Charles Clay, as both players saw the field for 18 offensive plays (28 percent) to Clay's 40 (62 percent). Clay has fought a balky knee among other issues for several seasons, so the situation between Thomas and Croom (both players have decent pass-catching ability) is worth watching in the event their senior teammate goes down for any length of time in 2018. Thomas (shoulder) hauled in a pass from Nathan Peterman at practice Wednesday, Mike Rodak of ESPN.com reports. Analysis: The backup tight end suffered a shoulder injury during the opening days of training camp, but his presence in practice Wednesday suggests Thomas is in good health ahead of Thursday's preseason opener against the Panthers. Thomas (shoulder) is practicing in a non-contact jersey, Heather Prusak of NBC 2 WGRZ reports. Analysis: Thomas hurt his shoulder during the opening days of training camp. The nature of the injury isn't clear, and there's no timeline for his return to full participation. 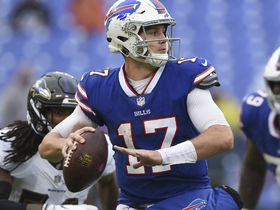 Thomas (knee) appeared to have suffered an undisclosed injury during Sunday's practice, Mike Rodak of ESPN.com reports. Analysis: The nature of Thomas' injury remains unclear, while Charles Clay is now the only healthy tight end with legitimate NFL experience on the Bills' roster as Nick O'Leary (foot/ankle) is also injured. Thomas (knee) is expected to be fully healthy in time for training camp, Jay Skurski of The Buffalo News reports. Analysis: Thomas was only supposed to be sidelined four-to-six weeks after undergoing surgery to repair a torn meniscus in May. It's no surprise that he's expected back for training camp, when he'll compete with a mix of depth-caliber tight ends for the No. 3 job in Buffalo behind Charles Clay and Nick O'Leary. Thomas underwent knee surgery and has been ruled out for the rest of the spring, Mike Rodak of ESPN.com reports. Analysis: While there is no specific timetable on the surgery Thomas was forced to undergo, the Bills likely won't be looking to force him back into action any time soon. Thomas is expected to enter the 2018 season as a depth option at tight end after posting seven receptions for 67 yards and a touchdown across 12 games in Buffalo last year. The Bills extended the exclusive rights tender to Thomas on Tuesday, ESPN.com reports. Analysis: Thomas and fellow tight end Nick O'Leary will remain in Buffalo next season. A converted quarterback, Thomas recorded seven receptions for 67 yards and a touchdown in 12 games last season. Thomas, subbing in as the No. 2 tight end for an injured Nick O'Leary, caught both of his targets for 10 yards during Sunday's loss to the Patriots. Analysis: The converted quarterback did see the field for 33 percent of the offensive plays, but with O'Leary about to return to practice this week, Thomas could be relegated to No. 3 and mostly a special teams role. The Buffalo Bills line up for a punt, but tight end Logan Thomas throws a pass to Robert Foster for a first down. Buffalo Bills rookie quarterback Josh Allen dancing around defense and connecting with tight end Logan Thomas for first down. 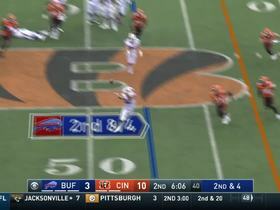 Buffalo Bills quarterback Tyrod Taylor throws to tight end Logan Thomas for a 22-yard touchdown. 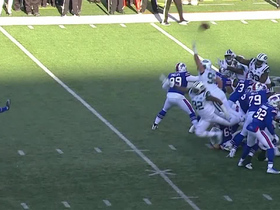 Buffalo Bills tight end Logan Thomas makes his first NFL catch for 2 yards. The "NFL Total Access" crew breaks down the decision made by Arizona Cardinals head coach Bruce Arians to start quarterback Ryan Lindley over Logan Thomas after just one practice. 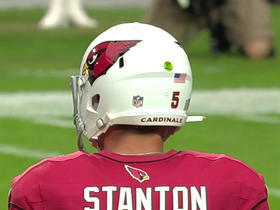 Colleen Wolfe and Gregg Rosenthal discuss the comments made by Bruce Arians on Drew Stanton's playing status and whether or not the Cardinals can win a game in the playoffs. 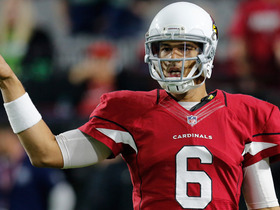 NFL Media's Omar Ruiz joins "Around the NFL" to discuss the quarterback situation in Arizona and what the thought process is behind starting Logan Thomas against the San Francisco 49ers. 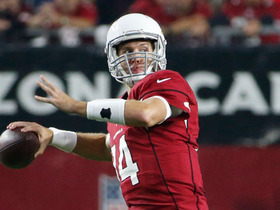 NFL Media's Marc Sessler discusses Arizona's decision to stick with quarterback Drew Stanton and the Cardinals' playoff hopes.